Art and I again spent our Christmas Holiday at our RV in Pismo Beach on the California Central Coast. 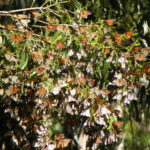 As in previous years we had the wonderful opportunity to witness one of Nature’s most beautiful events, the Pismo Beach Monarch Butterfly Grove of wintering Monarch Butterflies. The Monarchs begin arriving at the grove in October and will remain until mid-February when they will mate and travel on their northward journey to begin the life cycle of four more generations throughout the next year. The migrating Monarchs are solitary travelers reaching high altitudes traveling up to 200 miles per day and traveling up to 2000 total miles. The Monarchs cannot fly when temperatures are below 55°F. and they will cluster on the Grove’s eucalyptus and Monterey Cypress trees which help to provide thermal stability. The cool night temperatures slow the use of stored energy so the Monarchs can survive the long wintering life cycle of up to eight (8) months. The normal life cycle of spring and summer Monarchs is about six (6) weeks. Once the sun warms the air above 55°F. 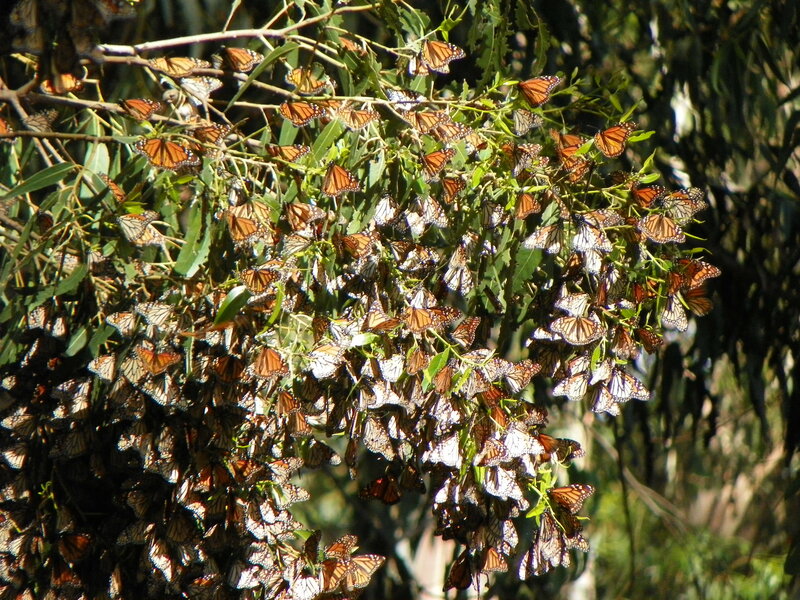 , the Monarchs begin to take flight and thousands fill the air in and around the grove. What a beautiful sight to behold. I would like to announce that Sunset Garden Club is planning a bus trip to the new Spring Mountains Visitor Gateway on Mount Charleston Wednesday April 26, 2017. The bus has been reserved and the trip is open to all Members of Nevada Garden Clubs, Inc. until the bus is full. All that are interested need to let me know as soon as possible. The Visitor Gateway is about a 30 minute drive from downtown Las Vegas. This is near the areas where our Penny Pines Contributions are being used in the recovery work to restore the damage caused by wild fires several years ago. A USDA Forest Service Botanist will meet us there to provide information on the recovery work progress. The Spring Mountains are part of the Humboldt-Toiyabe National Forest which is the largest National Forest in the lower 48 states and the only National Forest in Nevada. I look forward to visiting the rest of our Clubs that I have not been to yet. I am planning to visit Pahrump Garden Club with Larri Tarver and Vicki Yuen to encourage them to rejoin us. They were a great club to work with. Please remember the big rose pruning and cleanup at the Garden of the Pioneer Women will take place in late January or early February 2017. The Rose Garden Club will be in charge and all available NGCI Clubs are invited to take part. We will have three more cleanup times during the year which will be announced later. I visited the Cactus and Succulent Garden of Bob Middag of the Cactus and Succulent Society of Southern Nevada in October. Bob has 870 plants with 400 plants in the ground and 470 plants in pots. This includes Prickly Pear/Beaver Tail types, Succulents, Agave, Barrel, Columnar, Desert Perennials, Hedgehogs, Cholla, Yucca and Creosote. Now that is quite a garden.